Library ebooks now shown in Google searches! Google’s knowledge graph that shows up on the side of searches (or on top if you’re on mobile) is good for quick information. Until recently, if someone searched for a book, it would just show options for purchasing an ebook, but this past September, Google started offering users the option to borrow ebooks from a nearby library. This pairs with Overdrive, so titles from the Wisconsin Public Library Consortium are shown. The Google search screen doesn’t show whether or not the item is available, but the link goes right to the item they searched for so they can find out. 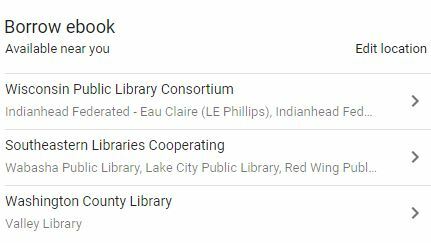 Maybe this will get new people to register for library cards now that WPLC’s collection is visible on Google! SCLS Tech Bits blog post, by Kayla, December 4, 2017.